Announcing when certain keys are pressed: This tells you when a modifier key (such as Control, Option, or Command) is pressed or when the Caps Lock key is pressed. Announcing pointer movements: You hear an audible alert when your mouse pointer switches among windows or when you click a menu. Announcing the position of the VoiceOver cursor: VoiceOver can audibly identify all OS controls (such as buttons, sliders, and list boxes) by using a special onscreen cursor. Reading documents, web pages, and Mail messages: VoiceOver can read aloud the contents of all sorts of documents and application windows. Speaking the characters you type: You can set VoiceOver to speak every character or each word you type. Click the Open Accessibility Preferences button on the Text to Speech panel. Click the VoiceOver item in the list at the left. Click the Open VoiceOver Training button to display a helpful interactive tutorial designed to help you understand and use VoiceOver. 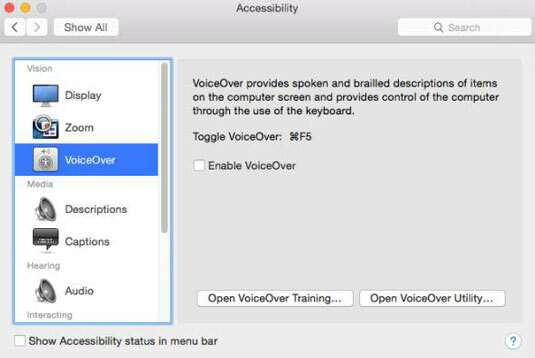 To customize how VoiceOver operates, click the Open VoiceOver Utility button.